Geneva, 13 January 2016 – The International Consortium on Combating Wildlife Crime (ICCWC) has unveiled its Strategic Programme for 2016-2020, detailing targeted activities, operations and initiatives the Consortium aims to deliver to support wildlife law enforcement agencies to combat illicit wildlife trafficking and enhance their capacity to take enforcement action to fight these serious crimes. Today’s launch follows the strong recognition of the need for increased international collaboration and coordination to combat illicit trafficking in wildlife, and the important role of ICCWC, which has been recognized at the highest levels of the United Nations, by ICCWC partner organizations and in other fora. 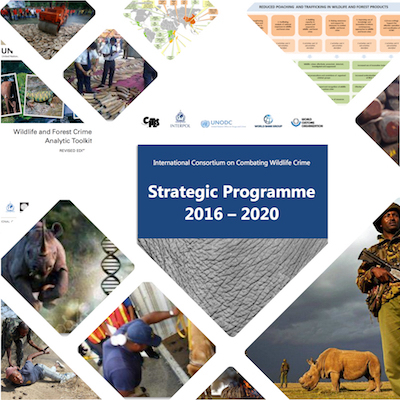 The Consortium’s Strategic Programme outlines the types of activities to be pursued by ICCWC up to 2020, including to strengthen cooperation and coordination amongst wildlife law enforcement agencies; analyzing and facilitating responses to wildlife and forest crime; strengthening national enforcement capacity; raising awareness and political support to combat illicit trafficking in wildlife, and; improving the use of knowledge and innovation to counter wildlife and forest crime. It was launched at the 66th meeting of the CITES Standing Committee (SC66) that is being held in Geneva, Switzerland, from 11 to 15 January 2016. During SC66, ICCWC hosted a number of events to showcase the range of tools and services available through, and being developed under the auspices of, the Consortium to support law enforcement. This included the launch of the ICCWC Indicator framework for wildlife and forest crime, developed to assist countries to measure and monitor the effectiveness of their law enforcement responses to wildlife and forest crime over time, and to identify any changes or challenges in their responses. The ICCWC Indicator framework will complement the ICCWC Wildlife and Forest Crime Analytic Toolkit, which continues to be implemented in a growing number of countries. The Consortium also provided information about its ongoing work on a global research initiative on the illicit trafficking in wildlife, which will culminate in the first World Wildlife Crime Report in the course of this year. A number of other initiatives and projects to provide operational support and enhance law enforcement capacity were also discussed, including for example a successful operation to trace, locate and arrest wanted fugitives of wildlife and forest crimes and the use of secure communication systems available to wildlife law enforcement officers. ICCWC’s ongoing work on forensics, including the development of guidance on timber identification materials and the launch of a training video designed to assist countries with ivory sample collection that will complement the guidelines for forensic methods and procedures of ivory sampling and analysis were also presented. The activities conducted under the auspices of ICCWC were formally presented to SC66 in a document prepared for the meeting. The implementation of the Strategic Programme and use of the ICCWC indicator framework will support efforts to combat poaching and trafficking in wildlife, as called for in the Sustainable Development Goals recently adopted by the UN Sustainable Development Summit. In November 2015, ICCWC celebrated its 5th anniversary, following the signature of a Letter of Understanding between the five ICCWC partners in November 2010. The vast array of activities conducted and materials delivered by ICCWC to date has been possible thanks to the generous funding support provided to the Consortium by the European Commission, the Netherlands, Norway, Sweden, the United Kingdom of Great Britain and Northern Ireland, the United States of America and the World Bank Development Grant Facility. ICCWC is the collaborative effort of five intergovernmental organizations working to bring coordinated support to the national wildlife law enforcement agencies and to the subregional and regional networks that, on a daily basis, act in defence of natural resources. The ICCWC partners are the Convention on International Trade in Endangered Species of Wild Fauna and Flora (CITES) Secretariat, INTERPOL, the United Nations Office on Drugs and Crime, the World Bank and the World Customs Organization. The mission of ICCWC is to usher in a new era where perpetrators of serious wildlife and forest crime will face a formidable and coordinated response, rather than the present situation where the risk of detection and punishment is all too low. In this context, ICCWC works for, and with, the wildlife law enforcement community, since it is frontline officers who eventually bring criminals engaged in wildlife crime to justice. ICCWC seeks to support the development of law enforcement that builds on socially and environmentally sustainable natural resource policies, taking into consideration the need to provide livelihood support to poor and marginalized rural communities.